We’re going to explore several desktop environments that can be used with Linux in the next five blog entries. But first a few words about Eerie’s goals and on how the DEs will be compared. For normal desktop pcs often not much of an issue, an energy-saving system can be crucial if you plan to use it on any pc that operates using a battery (e.g. a laptop). Still I think that a little economical optimization does not hurt at all. Wastefulness is never a good thing and today even more and more commercial developers try to “go green”. IMO this is something that should be declared a goal right from the beginning: Software should not only be designed to be optimized for speed and size, but also to be energy-efficiently. Got an old pc with less than 512 MB RAM? It can most likely run Linux, but usually it’s no fun. In times of tabbed browsing even just surfing the net often needs an incredible lot of RAM. Some applications actually demand amounts which are totally unacceptable on low-RAM systems. What to do in this case? Get some lighter programs, of course! But if we’re trying to optimize our system for low resources usage right from the start, one of the most important decisions is surely which DE we’re going to use. I’d like to compare some of the DEs out there, especially in terms of how heavy on resources they are. It would be nice to compare how energy-efficiently they perform, too, but right now I have no idea on how to measure this easily. So for my testing, the ‘r’ has to suffice for now. So here we have 15 possible desktop environments to compare (did I miss anything that would be interesting?). I don’t know if I succeed in getting all of them to run on my test platform, but we’ll see. I’m using VirtualBox for my tests. First I created a new VM and installed Gentoo (sticking more or less to what the handbook recommends). It’s based on kernel 3.3.8 and except for what the stage-3 archive contains, I’ve only installed sysklogd, logrotate, dhcpcd and lilo. -gtk -gnome -qt4 -kde -X.
I’ll modify it according to the needs of the particular DE to install. As the next step, I’m going to clone the VM several times and start setting up the various DEs. The next entry will deal with the modern GTK+ desktop environments. A few days ago pheakuser decided to join the project. He’s been into Linux for quite a while and has used a lot of different distributions over the years. Some time ago he was tinkering with Linux From Scratch until he run out of free time to continue it. But while he still does not really have too much time on his hands, pheakuser likes the idea of getting involved in building a new Linux distribution from close to scratch. One of the things he is especially interested in is coming up with a good replacement of the default filesystem structure which he considers antiquated and a barrier for innovation. To keep things short: Welcome aboard! We’re in for a little “desktop philosophy” today. It’s also going to be all text and no pictures this time. What does an operating system really need? The answer to this question certainly depends heavily on what you expect it to do. Does it have to come with a graphical desktop environment? Surely not per se, but it can be of great use if it offers one. Does it even have to provide access to hard drives? Again: Not necessarily. Yet it would be severely handicapped without such support! 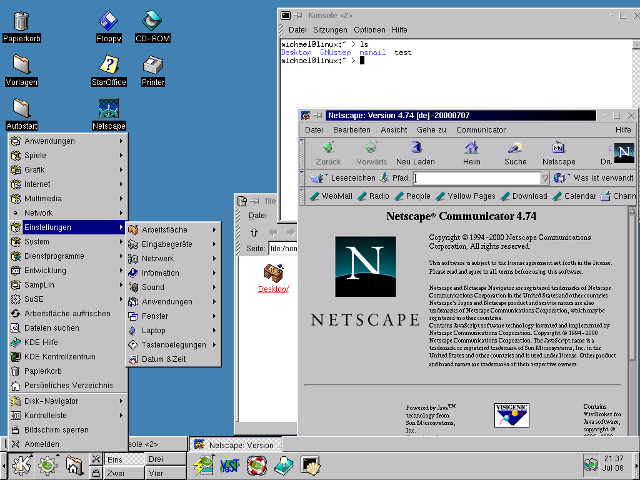 Even today there are many computers running a recent OS but without any GUI. And in fact a text mode user interface is completely sufficient for installation or maintenance e.g. of a server. But most users will expect a graphical UI instead of a text-based one on their home pc for their daily business – which is certainly comprehensible. Even though the shell is extremely powerful (assuming the user knows it well enough) there simply are tasks where a graphical environment is a lot more convenient to work with. And Eerie is about Linux for desktop use. Why not simply a full-grown DE? Most desktop environments today are cramped with “features” that often only few people really use. 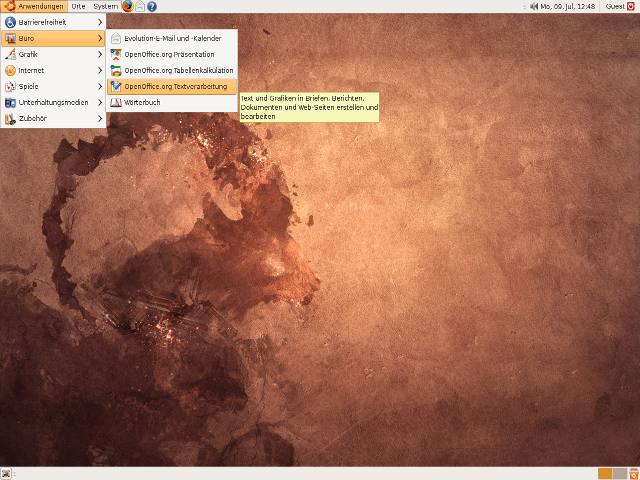 Just have a look at KDE plasma. Do you like what you see? It’s alright if you do (and each of your pcs offers what this resource-hungry DE demands). However many people are not interested in eye-candy and other fancy stuff but in fact prefer to turn it off. I’m one of those. Also not everybody has the money to buy a new pc every few years (or simply does not want to do so). Or think of the people who have several pcs among which are rather old ones, too. There are many reasons why one would use a desktop environment that’s not top full loaded with unnecessary ballast. Of course bare X11 may already be good enough for some users: It’s sufficient if you just want several terminals on your screen and perhaps a few simple applications. Adding their favorite WM is actually enough for a surprisingly high amount of people. Many window managers are fairly customizable and offer a lot of functionality. But if it has to be a “real” desktop environment – what does an elementary desktop need to provide? What are fundamental necessities, what basic functions? I guess, this is even harder to decide in times where big companies think that it’s a good idea to offer strange DEs. DEs for desktop pcs that clearly show that they were made with handheld devices in mind. All the so-called “innovative” or “modern” solutions aside, a desktop environment usually offers (at least) a fixed menu of some sort or another and some kind of panel where you can switch between your running applications. Does your ‘elementary’ translate to minimalism? To give the answer straight away: No. A minimalistic approach to operating systems is often exciting, informative and fun. However the result will be far from what but a few people might actually use. What’s a better term then? I thought about it for a moment. Among often used catchphrases, there’s “purism”, too. Purism is certainly closer to usability and can still be fairly minimalistic. But those -ism words are problematic in general. What’s the opposite of purism for example? “Opulentism”? Maybe that’s not such a bad word for it, after all. But these things are hard to grasp. Back to minimalism. Is “maximalism” just its opposite? Certainly not! It’s actually a bit confusing as they are both antonyms and at the same time rather close to each other… Minimalism as I understand it, means to get things running with as few features as necessary and perhaps as little drive space needed as possible, etc. Maximalism on the other hand should not mean to do things as bloated and resource-wasting as possible but on the contrary try to get as much as possible out of the valuable system resources. So both minimalism and maximalism are linked by the idea of extreme optimisation. While I think that the minimalistic way can make a very interesting experiment, I really like the idea of maximalism. But since I’d like to concentrate on older hardware, we’ll explore the “lower reaches of maximalism” with “eerie”. If it can’t be done with an old system and it’s not really needed: cut it from the standard installation. But also: Leave it in as an optional component for those who have a better machine and want it! A good system should be customizable or scalable as some people say. Let’s put it this way: An (ideal) elementary desktop offers every feature that is commonly needed and, while concentrating on these, could easily be extended. There are several approaches that may apply to how a desktop system can be built. Eerie aims for an elementary approach being somewhat minimalistic (by putting its focus on what is really needed) but without losing sight of the possibilities to add more features. The next entry will describe what the second ‘e’ and the ‘r’ stand for. It will also begin a comparison of several Linux desktop environments. Where was I? Right… Windows XP. When I first saw it, I just thought: “You’ve got to be kidding!” What was this? A blue task bar with a green start button and a terribly colorful background! I still recall what came to my mind next: “Don’t do drugs, man!” Of course, a few seconds later, I had it all set back to classic. Then I attempted to update the system. Guess what? It didn’t work – IE crashed. I tried again, but same thing. Great stuff! Reboot. What’s this? The desktop is back to ugly! Alright, let’s change it aga… What? It’s still set as “classic”? Wow, if that‘s classic, I don’t know where I’ve been all the years. Let’s set it to “new”. Of course nothing changes. And now back to classic. Ahh, much better. Windows update again? Crash! You know what, buddy? Just go to hell (from where thou must’ve risen)! Put DOS boot disk in floppy drive, reset. Wait a moment. FDISK. Yes, that was my first contact with Windows XP. And as you can see, we didn’t really get friends right away… Actually I disliked about everything of this new OS. The exorbitant size when installed, the wasteful usage of RAM, the way it dares to tell me what I wasn’t allowed to do (on my system! Who the heck decides this? Myself – or Micro$oft? ), and so on. Not even to talk about forced registration, which is completely unacceptable. M$ got our money and my father used to register every version of Windows with M$ – voluntary. Which is fine. But I was really angry and this was the moment when Redmond begun to lose me, too. I decided to go on with Win2k for as long as possible and then abandon the Windows platform. 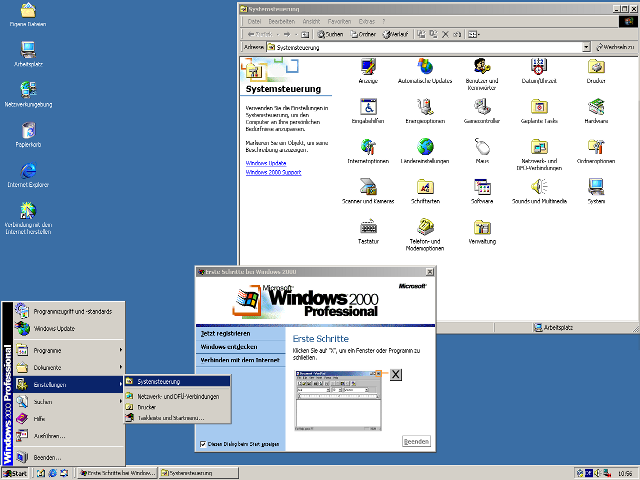 Windows 2000 with control panel right after installation: Clean looks. 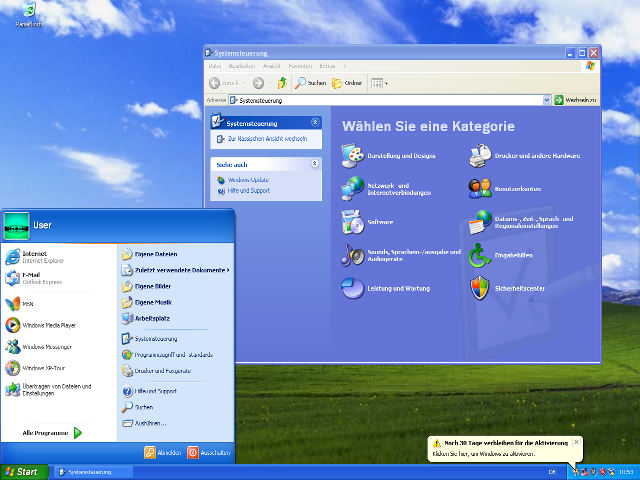 Freshly installed Windows XP with control panel: Could be called “CandyOS”! But where to go then? I had been playing around with FreeDOS and achieved some incredible things (burning CDs in DOS, watching DivX videos on a Pentium 90, browse the net graphically, running Windows applications on DOS, etc.). I liked the system a lot since I knew what every single file on my system was good for and there was not one program or anything there that I didn’t want to have on my drive. But frankly speaking… DOS is not a modern desktop system – especially since drivers are a huge problem and FD-32 seems to go nowhere. It’s very nice for tinkering but not a real alternative. I had known Linux for a while. That means I had known that it existed. A teacher who tried to get into it himself had founded a “Linux club”. Being interested in computers in general, I had joined it. But while the teacher was trying to get things working, the rest of us typically had Windows running on their machine and played network games or surfed the net. 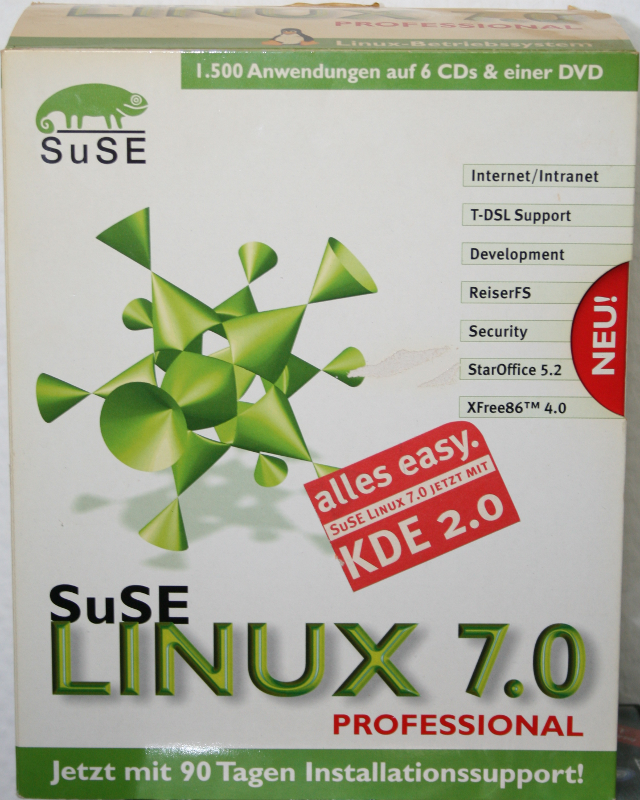 As far as I can remember, we started with SuSE 6.2 back then (SuSE was the most popular distro in Germany at that time). I looked at the system only briefly and found it to be far too complicated. What I disliked most at that time was the case-sensitive file system. I just witnessed it cause trouble all the time. At home I had convinced my father that we needed a router pc so that all our pcs could access the internet at the same time. We had another old pc that was just collecting dust anyway but no idea how to set up a machine as a router. Thinking about our club, I proposed Linux. It was allowed to copy it freely after all and I knew that it was perfectly suited for such a task. My father agreed but instead of downloading it for free, he bought SuSE 7.0 Professional. Primarily because of the support option for it as he said. It came with kernel 2.2.17, XFree86 4.0, KDE 1.1.2, GNOME 1.2 and StarOffice 5.2! Thanks to a friend who was a bit into Linux, we managed to get a router up and running. It was painful, though, and took us more than one evening/night of configuration work… But once the server was up, it just worked. And it did so for a very long time. Only after a power outage it refused to boot up again, since the filesystems were reported damaged. We reorganized our network so that we no longer needed the router pc. I kind of forgot about Linux for quite some time. When I bought a new pc, I got a dual-core CPU. Finally I realized that I could not really go on with Win2k anymore. I thought that I had no other option but to install XP. And as I had a legal license for it, anyway, I did. I was never happy with this OS, though and I still consider it a bearable operating system but surely not a decent or even great one. I heard about this new “Windows Vista” and of course read about it on the net. Now this time I wasn’t angry. “Vista” didn’t even deserve it. It was just plain laughable. Not an OS at all but rather an abomination. This time it was clear that I would never buy it. No sir, I’ve really had it this time! For a while I might stick with XP – but what to do then? One day when I was really fed up with my Win XP, I decided to give Linux a shot again and see what had happened in the meantime. Everybody was talking about Ubuntu these days. I knew that there were live-CDs and I thought that this was a pretty nice thing that I just had to try out for myself. So I downloaded an Ubuntu image and burned it on a cd. Shortly thereafter the fun started. It took quite a while to start up, but this was because of the slow cd drive. After it finished loading, I was immediately impressed. Now this was a desktop to my liking! Something way different – but for the better. Very clearly laid out and simple to use. At first I found it strange to have two panels, but I soon liked that, too. I played around with it for a while and for the first time in years, I “felt at home”. It was also great to have Open Office pre-installed just like many other useful programs. Since I was willing to change anyway, I made a backup of my drives and then installed Ubuntu as a second system. It worked well and I used it more and more often. After finding out how things work and getting replacements for programs I used to work with, I soon booted into Windows just rarely and finally decided to kick it. I also was a bit older now and didn’t consider things like the way the drives are organized “strange” but actually realized that it was superior. KDE 1 (SuSE 7) – this is what actually prevented me from using Linux in 1999. GNOME 2 (Ubuntu 8.10) – and this got me back to it! A lot has happened since then. My beloved GNOME 2.x is dead (save for MATE), Ubuntu has changed for Unity (which I deem unusable on a desktop) and so on. I tried out a lot of distros and desktop environments and learned to live with the big ecosystem that is Linux (GNU/Linux and other software but also the community and the spirit). There’s a mass of things going on – many that I like and some which I don’t like. But this is where you begin to do things your own way, right? The next entry will have the title: “Eerie’s first ‘e’: ‘elementary’!”.